I found this car in High Falls, NY. It had been used in Poughkeepsie, NY to shuttle passengers from the train station to the resorts in the Catskills. It was stored inside so it appears that it is all original wood. I have preserved the original patina by sealing it with satin polyurethane. I belong to the Adirondack Rusty Crankers Model T Club and we go on rides through the southern Adirondacks almost every weekend in the summer. This picture was taken in front of Union Station in Utica, NY. Another great model of its time, I think must watch a documentary about this. It is an impressive and graceful model. 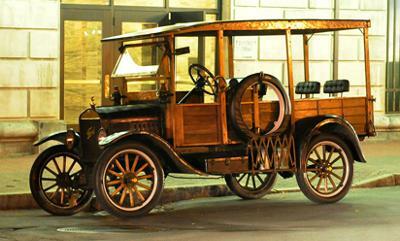 I am surprised even in 1920 there are such nice made of wood cars. Thanks for this amazing picture. I am in search of essay writer, to have my assignment done fast. I’ve always felt good about listing my concerts with you and linking from my website. You did a great job and thanks for sharing.